As a kid growing up in America, I heard/learned quite a bit about our capital city, Washington, D.C., in school. I know that it sits on the Potomac River and was named after George Washington. I know that it's the home to the U.S. government and that the White House was burned down during the War of 1812. But I knew very little about the *real* Washington, DC, until I visited as a traveler. Because even though The District is home to a lot of government-y types and even more history, that's not ALL there is to it. I've now been to Washington DC three times as a tourist. The first time was on a 7th grade trip, which I remember very little of (what can I say? I wasn't a blogger back then!). The second was back in 2013, when my boyfriend and I tried to go and see the cherry blossoms blooming – but the blossoms were late and we missed them. And the most recent trip was last month, when I went to DC to apply for a Russian visa. I decided to use this most recent trip to come up with a guide to things to do in DC that would include ALL parts of the city, from the historical to the government-y to the cool neighborhoods that make DC so much more interesting. 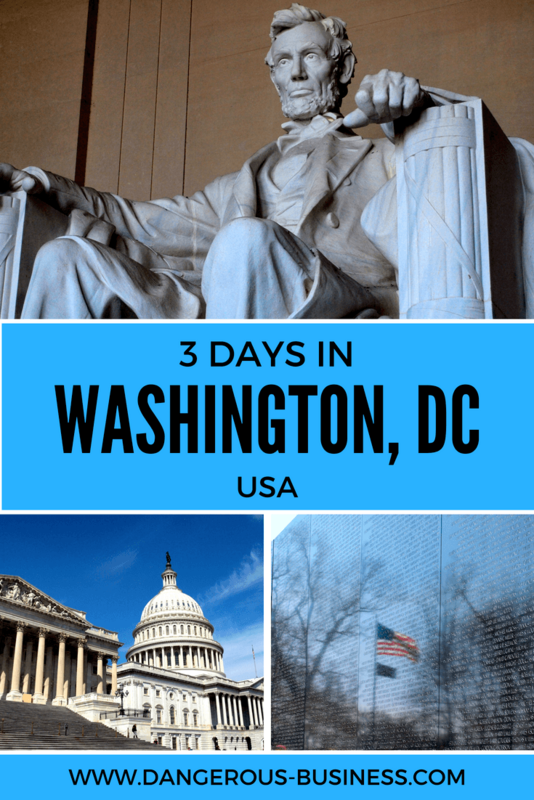 Trips to my nation's capital usually aren't long for most Americans, so here's my guide for what to do in Washington DC in just 3 days. Ready to get your tourist on? Because that's what I recommend for your very first day in Washington, D.C.! There's a LOT to see and do here, and some of the best things are actually the things you'll find listed in all the guidebooks. Washington DC's National Mall is probably the most famous part of the city (well, maybe other than the White House). It's where you'll find all the famous monuments and museums, stretching from the Lincoln Memorial to the US Capitol building. (Well, actually the second half of the area, between the Washington Monument and Capitol building, is the “official” National Mall, but most people consider it to include everything up to the Lincoln Memorial, too.) And, fun fact, it's managed by the National Park Service! All of the memorials are outdoors and free to visit, but be sure to wear good walking shoes – the Mall is huge! You can't go to Washington, DC, and not get a glimpse of the famous White House! You can take a slight detour to see it as you make your way down the National Mall, as it's near the Washington Monument (across the Ellipse). If you've seen photos of Washington, DC, bathed in cherry blossoms, chances are you've seen photos of the Tidal Basin. This reservoir is great for a stroll, or you can even rent a paddleboat to explore. You'll find the Martin Luther King, Jr. Memorial on one side of the basin, and the Jefferson Memorial on the other side. Both are worth seeing up close! While the National Mall doesn't “officially” stretch to all the memorials or the US Capitol building, it's natural to walk there since it's kind of the second bookend to the Lincoln Memorial. The US Capitol building is a pretty impressive sight, and nearby Union Station and the Library of Congress are also well worth a visit if you enjoy architecture. Don't put those walking shoes away just yet, because there's still a lot more walking to do today. Washington, DC, is known for its Smithsonian Museums. If you walked the National Mall on Day One, you likely saw most of these since they're all located between the Washington Monument and Capitol building. Today is the day to visit one or two of them. My favorites are the Smithsonian National Air and Space Museum and the Smithsonian National Museum and Natural History, but there's also a museum of American history, a museum of American art, the Museum of the American Indian, a museum of African American History and Culture, and even a postal museum. And the best part? ALL of the Smithsonian museums are 100% free to visit. Tired of the touristy sights yet? If so, you'll probably enjoy Day Three, which is going to get you away from downtown and the National Mall and into some of DC's coolest neighborhoods. Georgetown is a historic neighborhood located on the banks of the Potomac River. It's so historical, in fact, that it predates Washington, DC, itself, having been founding in 1751 in what was then Maryland. This means you'll find lots of beautiful old buildings, leafy streets, and even an old canal (the Chesapeake and Ohio Canal) in Georgetown. If you're going to spend a day wandering around a DC neighborhood, I would highly recommend Georgetown. Not only is it very pretty, but there are also lots of cute boutiques and restaurants to visit, too. And plenty of colorful doors to photograph. Adams Morgan is most famous for its nightlife, but the diverse and funky neighborhood has so much more to offer! I stayed here with a friend during part of my most recent DC trip, and enjoyed wandering down colorful 18th street, and especially loved how many choices there were when it comes to restaurants. You literally can find everything from Ethiopian to Italian to vegan BBQ (I swear it's a thing!) to Nepalese here. You'll find all the usual hotel chains in DC, but if you're looking for something with a little more character away from all the tourist hot spots, check out . The Normandy is a boutique hotel located on a quiet leafy street just off Connecticut Avenue near Dupont Circle and Embassy Row. The rooms are comfortable (and have seriously awesome wall paper), and the staff is top-notch. I felt more than welcome during my stay, and loved being within walking distance of some cool neighborhoods. The Normandy isn't next to the National Mall or anything like that, but it's close to both Dupont Circle (which has a metro stop) and Adams Morgan. Staying here gave me a different feel of DC, which I really loved. Other hotels worth checking out in DC include (a boutique hotel in Georgetown), (a luxury option), and the (for a very central location). Or, you can compare other hotels in DC here. Using the Metro – You can get a SmarTrip card at just about any station, and one-way ride fares start between $1.75 and $2.15 depending on the time of day you're traveling. Taking an Uber or Lyft – Both rideshare companies operate in DC, and rides often aren't that much more expensive than if you use public transport (especially if you opt to share your ride with someone else). Go on a Big Bus tour – Lastly, DC offers hop-on, hop-off tours on double-decker buses like many other large cities. These tours can often be a great way to see a city AND get to where you want to be at the same time. has four different routes around DC, including ones that will take you to places like Georgetown, Arlington, and Mount Vernon. Do you have any other favorite things to do in Washington DC? *Note: I was a guest of The Normandy hotel for two nights during my stay in DC. However, you guys know I never recommend things to you guys unless I actually like them! Sounds like a fun trip! My boyfriend and I took a trip there last year – neither of us had been since we were kids. It was a lot of fun seeing DC as an adult! The Newseum was one of my favorite places too! It’s definitely different as an adult vs. as a kid on a field trip! And yes, the Newseum is so good! You should still be able to fit a lot in, Maria! I hope you have a great time! Tip for going to the National Zoo: get off at the Cleveland Park Metro stop and walk straight along Connecticut Ave. It’s a leisurely walk on flat terrain and you’ll be walking through a well-known neighborhood. If you get off at Woodley Park/National Zoo Metro stop, you’ll have to walk uphill. For parents with kids in strollers, Cleveland Park Metro is your best bet. That’s a great tip, Elisa! Thanks for sharing! I’ve been to DC three times and never run out of things to do. I’ve been inside the White House twice and to an Easter Egg Roll on the White House grounds. I’ve also been to the Pentagon post-9/11. But my favorite thing is the Holocaust Museum. Walking through there is so incredibly vivid and consuming that when you walk back outside into the sunshine of present-day, it’s disconcerting. It will haunt you for years. I haven’t yet been to the Holocaust museum. I hope to go one day, but after actually visiting Auschwitz in Poland a couple years ago, I’m not quite ready to revisit all those emotions again yet. I’m really inspired now to visit Washington DC! It’s never been high on my list but the national mall and free(!) museums look great! It’s a really great city for sightseeing! You should definitely go if you have the chance. If you need a break from monuments and museums, only a few miles away is the Billy Goat Trail on the MD side, or Great Falls park on the VA side. Both hug the Potomac river, with scenic views of the river and incredible rock scenery. The river drops into a gorge that is used by Olympic kayakers. Visitors can view the dramatic scenery from outlooks, or hike the Billy Goat trail, with its rock scrambles. This is part of the C&O Canal system, so not short on history. One-hundred years ago, gold mines and shipping were found here. Good to know! There are so many places near DC that I would still love to see. I’ll have to add the Billy Goat Trail to my list! DC is such a great walking city. And the museums are excellent — you can definitely spend a full week just visiting them alone. The Jefferson Building at the Library of Congress is GORGEOUS — definitely needs to be seen, even if you’re not doing research. Great article thanks for sharing 🙂 I have not been to DC yet but I have family that lives close by so, I am sure I will be going one day. I especially liked your tip to explore Georgetown; the buildings there look amazing. You should definitely go! And yes, Georgetown is my favorite part of DC (so far). It’s so pretty, and a great neighborhood to explore on foot. Great pictures! I remember finding the Korean memorial statues really creepy. You still packed a lot into one day! Thankfully a lot of the museums are free to make up for the ones that are a bit more pricey! I loved the Newseum! Such a unique concept. I did a day trip to DC with my friends in the Baltimore area awhile back and did some of the touristy things, but definitely need to return for a longer period of time to get more of a feel for the place. You can easily fill up a few days in DC. I’ll definitely be back to see even more! These are all wonderful places to visit and explore in DC. There are a lot more places I haven’t gone to there but this post is helpful to build an itinerary for a trip there. Thanks Dave! 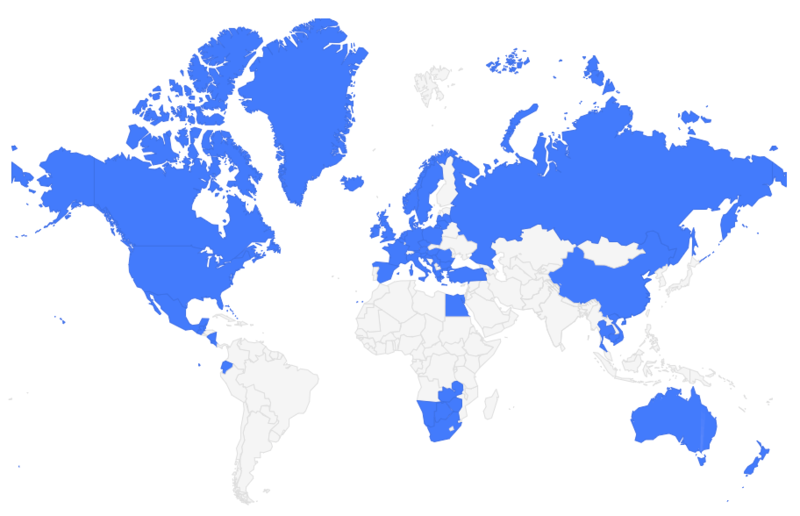 You’re right – there are lots more places to visit, too. But I think this is a good start! I spent almost five hours at the Newseum. I guess I’m a bit of a journo nerd but it is honestly one of the best museums I have ever been to. I tell everyone heading to DC to go there. There are so many places on your list I’ll need to check out next time I’m there! The Newseum is SO good. Even my boyfriend loved it (so it’s not just journo nerds!). We spent exactly 3 days in DC on our first visit and it was definitely not enough. Once we discovered the Smithsonian museums we knew we could spend a whole day in most of them. 😀 But we fall in love with the city, too! I know, the Smithsonian museums are so good! I spent quite a good deal of time in the Natural History museum on my most recent trip, partially because it’s so cool and partially because it was SO HOT outside that the air conditioning was too good to leave. Haha. We just got back from a trip to DC and all of these tips are great! We absolutely loved wandering around Georgetown after grabbing breakfast and coffee there, I can’t wait to visit again as there’s so much to see and do. Also, the Holocaust Museum was free too and totally worth a visit next time you’re there. I definitely need to make it to the Holocaust museum next time! I’ve heard it’s very well done. Growing up I never thought much of visiting Washington DC, but the older I get the more I want to go. I love history, and seeing how much there is to do, I can definitely see a Washington DC trip in my future! I didn’t know all of the museums you mentioned were free! The Newseum would be a must visit for me. Well Washington, DC, certainly has plenty of history! And all of the Smithsonian museums are free – but sadly the Newseum isn’t (though it’s so awesome that I totally think it’s worth paying to visit!). I love DC because there really is so much to do there! I love all the great restaurants and sights – especially the spy museum! Honestly, can you think of a better museum because I really can’t. Any excuse to pretend to be James Bond for a day, am I right? The Newseum is my personal favorite – but there are so many good ones to choose from in DC! I’m a DC local and always love to see it featured on blogs! This is a great city to visit, but it’s also a great place to live. As a tourist, you’ll probably be mostly centered around the mall (where all the monuments and half of the “big” museums are), which is more than understandable. But I appreciate your inclusion of other neighborhoods, Akatuki — there’s so much more here than the main tourist attractions, and staying in a neighborhood that isn’t right around the mall will help you see a little bit of how Washingtonians actually live! The neighborhoods around the mall (Farragut, McPherson, L’Enfant Plaza are the metro stations) are convenient for tourists, but nobody actually lives there and they’ll feel quite dead at night. I’ve done a lot of the “touristy” things in DC before, so this time I definitely wanted to spend more time wandering around the neighborhoods. I had about 3 others that I had hoped to visit, but the weather unfortunately did not cooperate on my most recent visit – it was too hot to walk very much! George Town looks really pretty! Thanks for this post. It’s a very pretty part of the city! I’ve been to the National Mall a lot because I often visit family in the area, but also because of family, I haven’t had time to go exploring the different neighborhoods! Next time I’ve got some free time there I’ll have to do that instead of the Mall again! The last time I was in the area I was driving towards the Olney area and saw a sign that said “Underground Railroad Trail”. Next time I would love to check this trail out. Have you been anywhere that had a hiking trail that followed the Underground Railroad? I don’t know about a hiking trail, but DC definitely has ties to the Underground Railroad – I’m sure that would be really interesting! I love DC! It’s a great stop on a larger tour of Virginia, too (vineyards, Shenandoah hiking, etc) – one of my favorites from DC was the monuments by night tour – really good to see everything all lit up at night! Yes, the National Mall looks wonderful at night! That’s actually how I saw it the very first time, and I’ll never forget it! I’m glad I stumbled onto this blog. The best guide I’ve found so far. Maybe it’s the way your writing is so fluid combined with the great photos but I feel like I’ve actually been to D.C. Can’t wait to explore D.C.! Thank you so much. Aww thanks so much! Glad you liked the guide! Yes, there’s a lot more to do there than most people realize! WoW! What an extensive writeup on D.C.! Thanks! There’s so much to do there!